If there is one thing I know about getting older, it is that taking care of my skin is becoming more and more of a challenge. Happily, I have a partner to help me and you can, too. 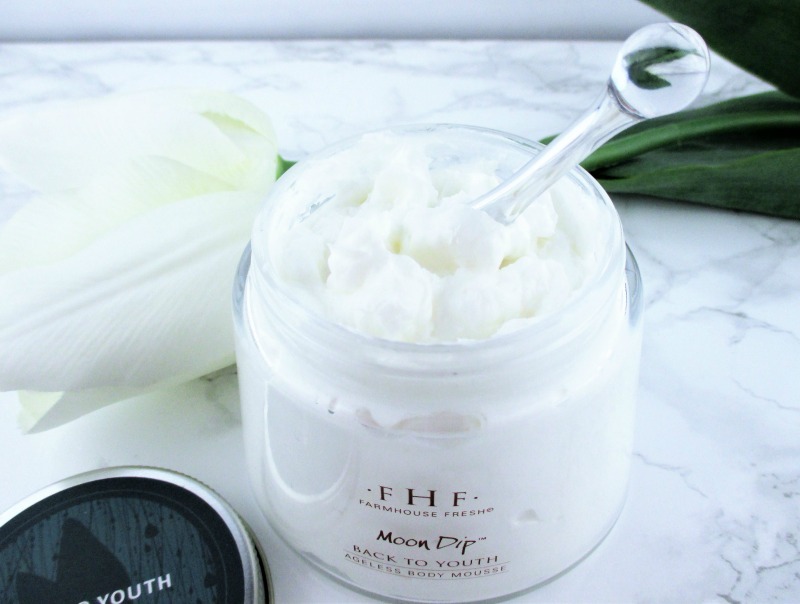 Farmhouse Fresh Moon Dip Back to Youth Ageless Body Mousse Is my skin's new spring time bestie. This big, glass jar full of hydrating, skin smoothing goodness contains vitamin rich skin loving emollient natural oils and peptides that soften, hydrate and improve the feel and appearance of dry, crepey skin and wrinkles. 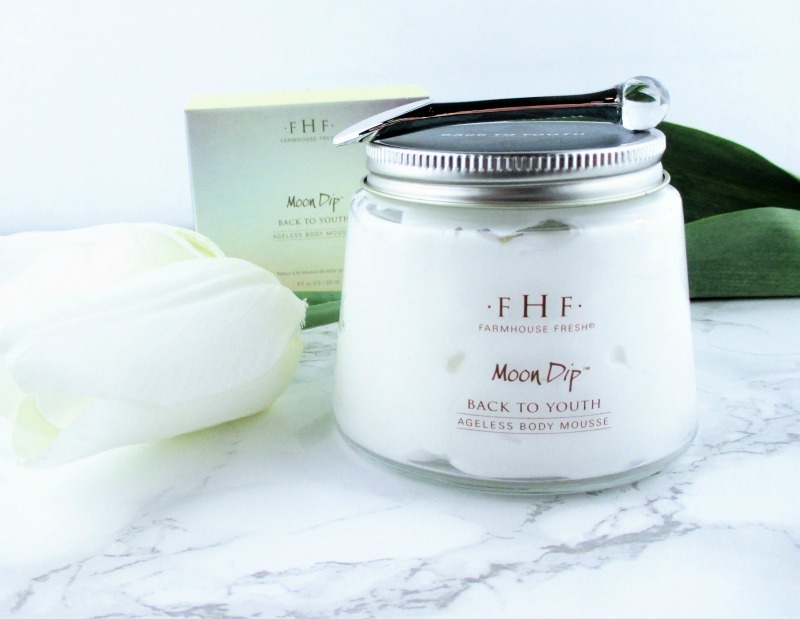 I love the feel of Moon Dip; the whipped, light as air texture smooths readily across my skin and without too much rubbing-rubbing-rubbing drops right in to moisturize and leave my skin velvety soft, glow-ey and gently scented with Farmhouse Fresh's sweet, creamy milk-oat fragrance. I know that I say this about a lot of Farmhouse Fresh products but it's only because it's true; I love this body mousse! The way it feels, the way it smells, the way my skin is so soft and pampered when I use it. If you want to get your skin to look and feel softer, smoother and even a little younger, you need to get this stuff. 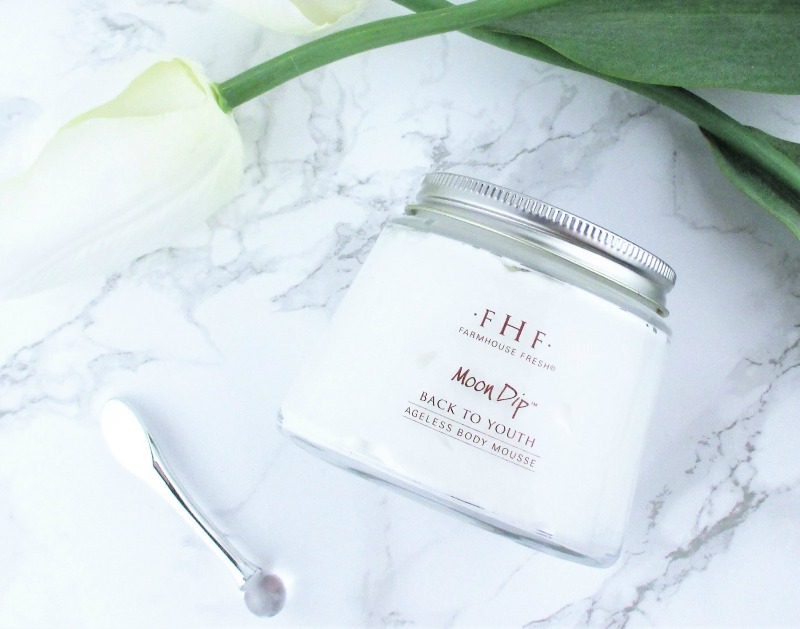 Farmhouse Fresh Moon Dip Back to Youth Ageless Body Mousse, $32.00 - 8 ounces is cruelty free and free of gluten, parabens and sulfates. This product is not vegan, it contains beeswax and lanolin. This body mousse is absolutely incredible, and I completely agree with your assessment of it. I have yet to find a product that I don't love from FHF! They really make incredible products! I am a true and loyal fan of this line. I have yet to try to product that doesn't work and that I don't absolutely love. Sounds like a great product. I really love the packaging! I finally found a body cream that I love as much as my products from Nature Island Botanicals. This stuff is truly fabulous! The fragrance and formula sound so divine! I need to try some FHF asap. This sounds like a great product. The price tag is a bit off-putting. Sounds like an amazing product.I need to try some FHF. The creamy - oat milk fragrance sounds so fresh. This sounds and looks really nice! As usual, fabulous photos. My blog partner loves this cream and is so happy that the fragrance was too strong for me. You've made it sound terrific. I do love this brand! But it always smells like sweets and I want to eat it! I've heard so many good things about FHF! I really love the spoon! I love this body cream SO much! The feel, the scent, everything. This body mousse sounds positively divine! I've heard SO MANY good things about this! That looks so lush! I want it! What a lovely name! A body mousse that smells of milk sounds utterly luxurious! Yum! I may need a moon dip, dip! This sounds awesome! I love the little spoon! Having long nails makes getting stuff out of pots a bit troublesome, this would solve that for sure!